Red velvet tapestries draped over tacky pastel plastered columns. Crystal chandeliers, maybe ten in number, glistening as ice sculptures against a purple rain background, under one hundred pulsating stars peeking down on us like one hundred piercing eyes. The walls drowned in burgundy reds and smoky violets, heavy with mirrors in baroque gilded frames and guarded by stucco Romanesque statuettes in soapy whites and shady grey. End on end hang shoddy portraits collected from a flea market’s unsalable leftover corner. Alternatively, they come from the owner’s hand, an artist, I’ve been told. Either way, they fit right in, in this ballroom of immaculate imperfections. And then,and there, prominent centerpiece on the long marble counter fencing the display of faceted bottles on the shelves, from an amphora grows an extravagant bouquet of semi wilted flowers, the stems over bending , the chalices like open mouths with petals lush as fleshy lips, a grand bouquet, slowly dying yet alive, slowly fading yet splashing colors to all sides. More flowers on the walls and more in black and in yellow specked China in every corner filling space. They are plastic, I then figure. And they should be, I start to understand. Because nothing here is quite what it seems, nothing here quite normal, thank God, from the star studded ceiling to the glossy mosaic floor, everything in “Cafe De Las Horas, thank God, is an invitation to the fantastic, a incantation to a dream. And Billy Holiday sings as she cries about ‘Her man’, while we weep about our battles lost and celebrate our battles won. And we sip Agua de Valencia and nibble on olives in virgin oil, while our stories sail the seven seas and grow wilder with every new cup down. And behind the counter, a young handsome twin brother of Prince prepares us another pitcher while his friend shows him his party gadgets for a much later night tonight. From his bag he flashes shocks of black raven hair and a silver tiara and a belly dancer’s belt and tapered leather strings and little black hat with knitted lace veil. And new guests step in, by twos and threes and they find their tables in unseen corners, and the lights dim low and free the music and the evening darkness yields to a midnight haze. 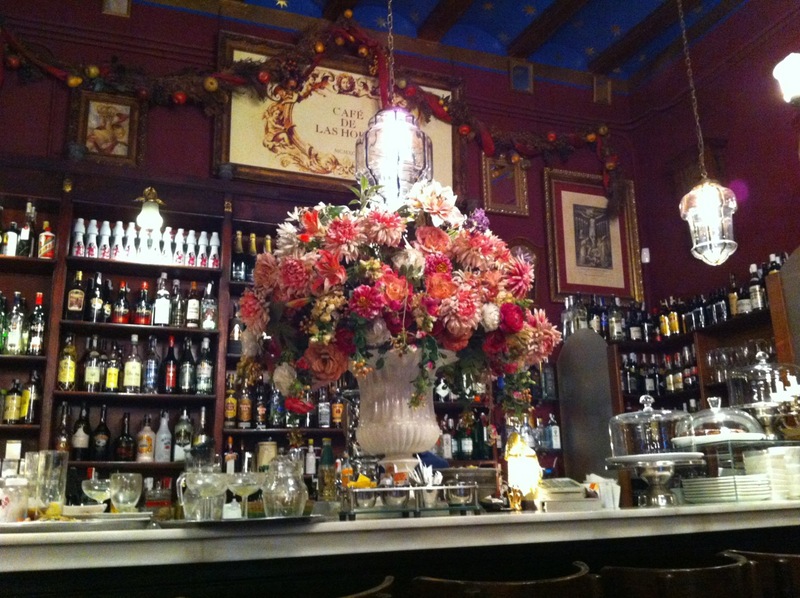 And nothing is what it seems in Cafe de las horas, and Ernest Hemingway was never here. But we were, my dearest, and I will remember.